JuliaBobbin: Sunshine and Spots + Give Away Winner! Sunshine and Spots + Give Away Winner! Thank you to all the lovely people who commented on my recent blog post ‘lace giveaway ….’ And for all your colour suggestions for the vintage dress that I recently purchased the pattern for. Looks like I’ll be making about ten different colour versions of this dress, which could not possibly be a bad thing! The winner of the delicious guipure lace was selected by random. I assigned a number to each person who left a comment and then got my husband to pull one name out of a hat. To highlight the importance of the task, I made him thoroughly wash his hands first, and then wrap them in 100% silk before selecting the random number from the hat. These things must be done properly! So, without further ado I am very excited to announce the winner of the Guipure lace is the lovely ….. Thank you everyone for your super kind comments that filled me with all sorts of warm and fuzzies. Meanwhile, here’s a lil’ something I’d been working on. I call it ‘Sunshine with spots’ because … well, it’s yellow, and it has spots. This dress is another creation made with Tessuti Fabrics. The yellow shell is a Stretch Cotton called Canary which was an absolute delight to sew with and had the added benefit of cheering me up every time I looked at it. You just can’t help but feel a little more chipper when you look at such a friendly colour. I made little ‘stick-out’ sleeves (pretty sure that’s not the technical term) which I lined with the same polka dot cotton. Isn’t it pretty?! I made my first attempt at a scalloped hem on the skirt of the dress. It gives it a playful look and was surprisingly straight forward. 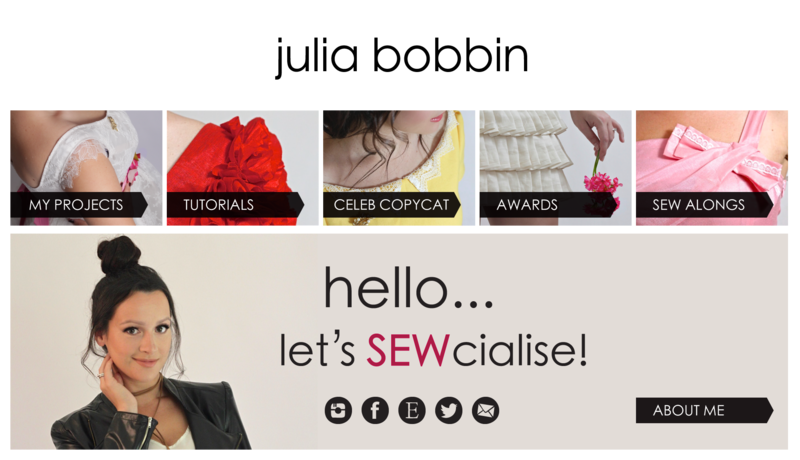 I'm seeing scalloped hems everywhere at the moment and so I thought I'd see what the fuss was all about. I quite like the idea of the scalloped hem, though it does make me feel a little bit Wilma Flinstone. I adjusted the width of the skirt back on account of my fuller behind (thank you Christmas!) without changing the side seams and hem, using my recent technique. You can see the ‘How to’ blog post here. I made a round scoop neck on the front and back. Thanks again lovely people for following my blog and helping me celebrate my first milestone! Thank you, and yes I do love a peter-pan collar. I know exactly what you mean about buying print fabric; it used to be all that I would buy! Lately though I've been trying to discipline myself to try straight colours but then jazz them up with trimmings. I always like them when I've made them. In fact if I look at my closet before I started sewing I pretty much own nothing with a print! Boy that changed when I started sewing. 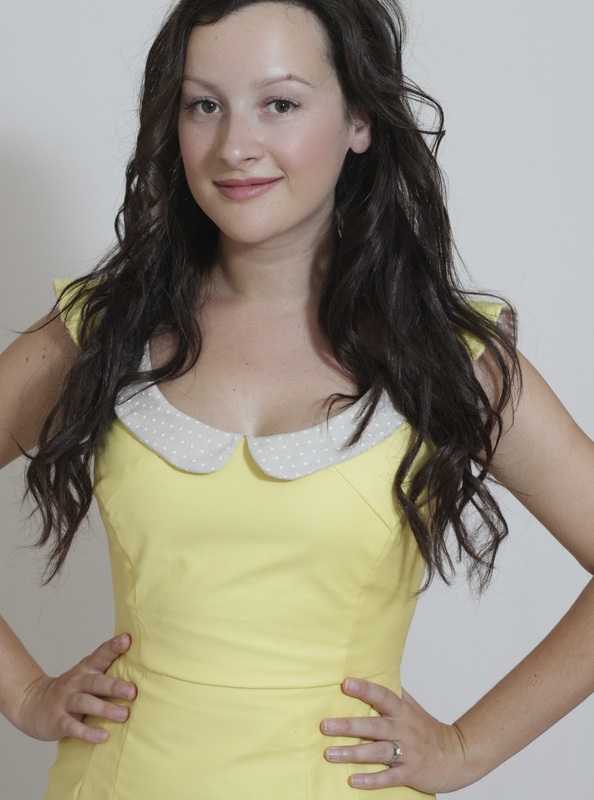 You look totally yummy in that yellow dress! Such a happy dress - surely only good things can happen when you're wearing it! Such a lovely colour and the neckline is gorgeous! 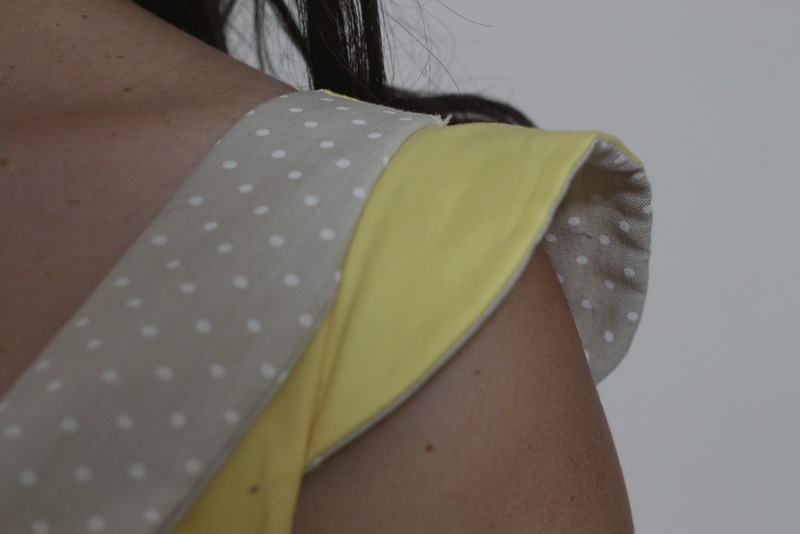 I love the yellow colour of the dress and it's such a great idea to line the sleeve with the polka dot fabric. That's a nice little detail. I wish I could wear this colour as it looks great on you - I have a dress in a similar colour but it's mixed with a lot of white and lilac, and only so it works. cute dress! 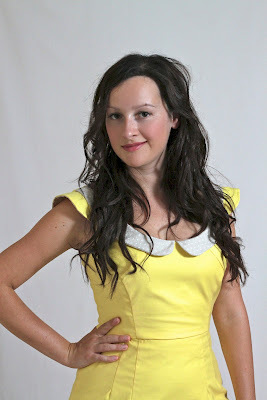 i love the peter pan collar on the scoop neckline! It so cheery and pretty. Nice work! Why is everything you make the absolute best? You inspire envy in all who look upon you. Seriously, this is so cheerful and fun and sweet, absolutely adorable. Well done, as always, sigh. Gorgeous colour and a great design. This yellow reminds me of your New York Cape - definitely your colour!!! Love the Peter Pan collar and those sleeves. It does doesn't it!! I guess I'm drawn to bright citrus colours. I never would have thought before I made the cape that yellow suited me but I guess it does! You are one chic ray of sunshine in this dress! The little Peter Pan collar and the scalloped edge make your dress distinctively fabulous! I'm loving the Peter Pan collars. I think I'll have to give one a go! Lovely blog BTW. Super cute dress, and it looks just perfect for summer! I had a go at scallops on a skirt a little while ago, and they're surprisingly fiddly - but yours look amazing! How awesome is stretch cotton? I've had my eye on that japanese spotty stuff for a while, but was undecided as to how to incorporate it. So I love what you've done here - I especially like your little cap sleeves! Great lines there. And I'm a huge fan of a scoop neck back, which you pull off with fabulous aplomb. Another gorgeous creation! Thank you Miss Poppy Kettle! Yes I'm always nervous approaching fabric with a bit of stretch, but this fabric was excellent quality and so lovely to sew with. Thanks for your lovely comment! Wow Julia. I just found your blog and I love it. I'm a fellow seamstress mainly of dresses which means you inspire me a lot. Hi Anna and welcome! So glad that you found me, I just checked out your blog and I'm in love with your creations. I am now your newest follower! Loving you and the cute lacy socks with heels!